DOOR ALARM - Model DAPT-WT - SOUNDS IMMEDIATELY! 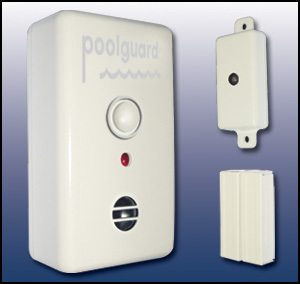 POOLGUARD/PBM INDUSTRIES, INC. has been manufacturing pool alarms, door alarms, and gate alarms since 1982. All Poolguard products are proudly Made in the USA. Poolguard Door Alarms comply with all building codes and are UL Listed under UL 2017. The majority of children that drown in pools go out the back door first and Poolguard's Door Alarm can help protect those doors. Adult pass through feature allows 15 seconds for adults to pass through the door without the alarm sounding. The Door Alarm will sound immediately when a child opens the door, and will continue to sound if the door is left open. If a child goes through the door and closes it, the alarm will sound for 5 minutes and then automatically reset. 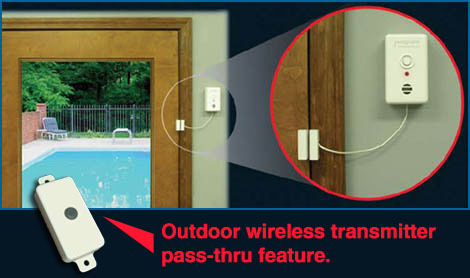 Poolguard Door Alarm Model DAPT-WT is equipped with an Outdoor Wireless Transmitter that allows adults to enter the home from the outside without the alarm sounding and is easy to install.